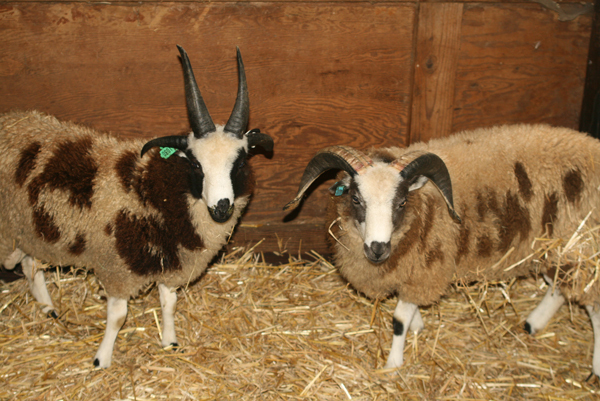 Our new sheep are here! A couple of them have been on the road for two weeks. I wish I could tell them that their travels are over because I’m sure they are just waiting to be put on another trailer. Bringing new sheep home is fun, but it should be done with care. As much as I would like to turn these new sheep out into the pasture, this would be haphazard because they have been exposed to a lot of different sheep and farms over the last couple of weeks. 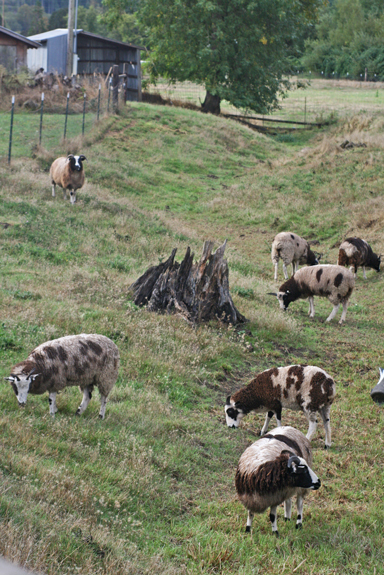 I would hate to expose my sheep to an unknown threat, so the new sheep will have to wait a little longer to enjoy the Oregon grass. I have them in a quarantine area in the barn. This will help acclimate them to our property and I can watch them closer for any signs of distress. I am also taking this time to worm them. In addition to buying new sheep, you could also be buying worms that you don’t currently have in your flock. It is recommended to worm with 2 different classes of wormer. It is best to flush the worms out in your quarantine area and not in your pastures. 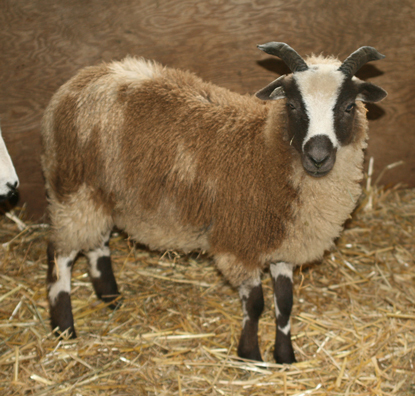 a handsome 4-horn ram lamb from Peg Bostwick. His name is Sweetgrass Clint and he will be traveling to California with Robin Lynde in the middle of October. 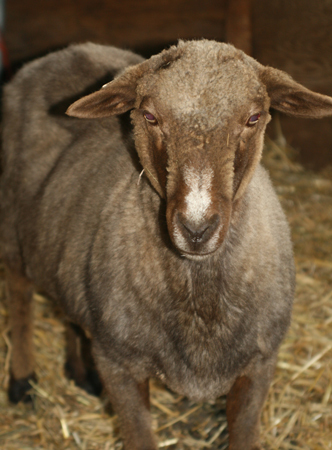 Albus’ traveling partner – Blue Ewe Meg. 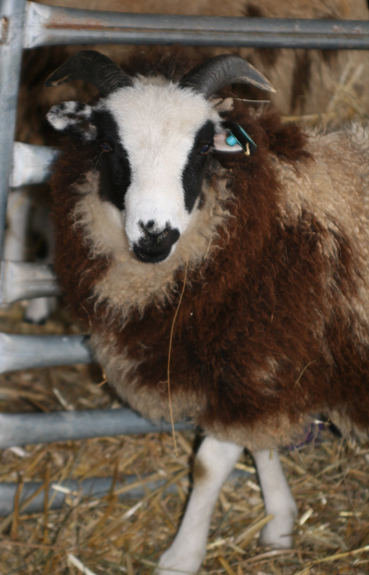 Very pretty girl with a lovely fleece. An unplanned (but one I am excited about) purchase from Dan Carpenter. Such a cute face on this girl. Her name is Dandy’s Hope. This girl may look a little out-of-place 🙂 She is a Navajo-Churro from my friend Karen at bide a wee farm. 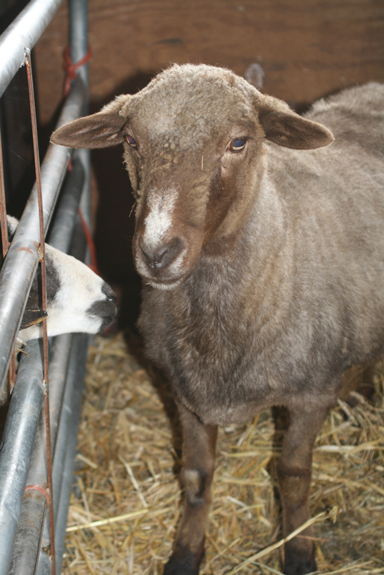 Her name is Ursa and she is the ewe that I mentioned briefly in a previous post about breeding to one of my ‘brown’ looking jacob rams. I can’t wait to see the resulting offspring and am hoping for something other than black. I wish I understood color genetics better (I am TRYING) so that I could discuss it with some intelligence. So, please don’t ask any technical questions – but feel free to help me in understanding the extension brown and dominant black aspects! On another note about Ursa – her name means ‘bear’. So far I haven’t seen that she takes after her name, except for maybe looking like a big brown bear. The churros aren’t much bigger than the jacobs, but just that little amount seems like a LOT!!! now he has his eyes (nose) on Ursa. You did GOOD, Shannon. Very nice additions! Albus is looking so handsome. I also really love Meg! That is a very good question – a lot 🙂 That is one of my favorite things about lambing season. Remembering the names and who they go to is one of my odd talents. Now, you have me wondering…I will have to go count how many sheep we have named! They are all real nice looking sheep. 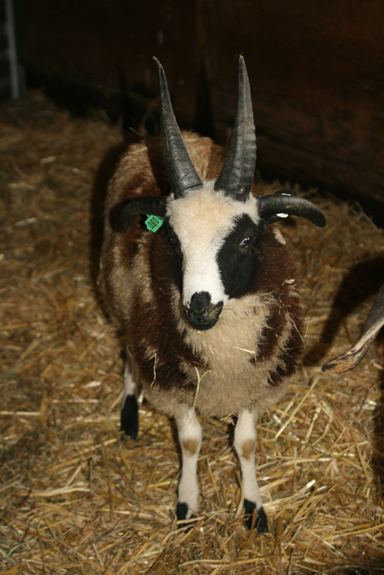 Albus’s horns remind me of Nitro’s horns some. He has a very handsome face. He reminds me of Nitro too. I think Albus is going to have more of a curl. Nitro’s horns weren’t curling at this stage. I love his face too. What gorgeous animals. I am curious what traits you are trying to get from the breeding with Ursa?